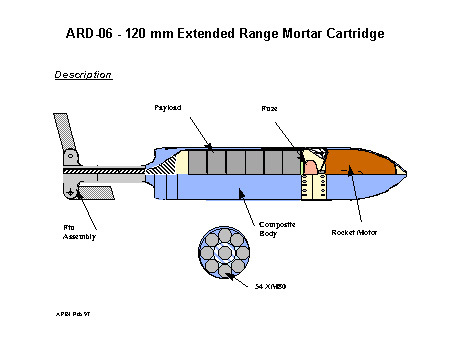 In June 2000 Alliant Techsystems (ATK) said it had entered into a teaming agreement with Israel Military Industries Ltd. (IMI) under which the companies will co-produce IMI's M971 120mm Dual-Purpose Improved Conventional Munition (DPICM) mortar cargo ammunition for sale in the US. Under the agreement, IMI will transfer the production technology for the 120mm DPICM round to ATK. Both companies will manufacture portions of the round in their respective countries, with ATK serving as the prime contractor for final systems integration and sales to the US military. The addition of the IMI 120mm mortar cargo round to its munitions portfolio gives it a product that can play an important role in the U.S. Army's transformation to smaller, lighter, and more deployable forces. With the increased emphasis on fire support in the new brigade combat team concept, mortars will take on greater importance as a weapon system. The IMI cargo round can increase the effectiveness of the 120mm mortar system because its expanded target pattern offers greater lethality against a wider variety of targets than the standard high-explosive round. That means fewer rounds needed and reduced logistical requirements - a major concern for combat forces that need to respond rapidly.